A cross-community Christian group has celebrated 25 years of “building bridges, not walls” throughout the Larne district. The Tuesday Group was set up after the IRA ceasefire in 1994 and over the last quarter of a century has worked to bring people of all faiths and backgrounds together to help create a more inclusive and peaceful society. A celebration lunch to mark the landmark anniversary - and the group’s final meeting - proved the ideal opportunity to bring together some of those who helped with its formation. Sister Margaret Rose described the past 25 years as “a lovely journey” which took “various turns” but was one which the group always managed to take together. She recalled how the situation in Northern Ireland was “dire” in the 1970s, and how within the fellowship of the Sisters of the Cross and Passion there were discussions about what they may be able to do to contribute positively to help meet the needs of the day. “We had a brainstorm to try to break down the division on our own doorstep,” she said. From those initial seeds, the Tuesday Group grew and flourished, drawing interest from those with other church connections. Robert Alexander explained how, having been brought up in the predominately Protestant area of Clough, he had few opportunities to meet anyone from a different faith. He told how the IRA had blown up his shop in Larne in 1977 and how his brother-in-law had his leg blown off in an IRA bombing and how these personal experiences caused him to wonder why people would turn to such violence. He spoke of the “tremendous challenges” in bringing people from different traditions together in those early years even though they “should be a family in Christ Jesus”. Former Larne Methodist minister, Rev Andrew Kingston, a past chairperson of the group, recalled being a little reluctant when first invited along. “I was quite comfortable in my own Methodist silo,” he admitted. However, when he ventured along to the Tuesday Group, he found a warm gathering of people from various backgrounds who had come together with “a real sense of community”. Rev Kingston recalled a number of dedicated individuals - including the then pastor of Larne Elim Church, Gordon Graham, the Sisters from Drumalis and Robert Alexander - who were an example to many others. Very Rev Stephen Forde, Dean of St Anne’s Cathedral, Belfast gave an inspired talk about how he viewed the ecumenical role of the group over his 19 years as rector in Larne. He quoted Jesus’ wish that “all be one” and said that we all should work together in a kaleidoscope of faith to glorify God, as the Tuesday Group had been striving to do for its 25 years. While the IRA ceasefire may have represented the decommissioning of weapons, he said there was also the need for the decommissioning of minds. “Each in our own way have sought to bring the communities together. 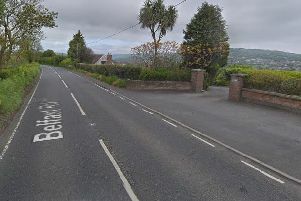 The reputation in Larne is not always the most positive,” he admitted. But, the Dean added, “faith that is shared is much greater than that which divides us”. Speaking on the conclusion of the group, Dean Forde said its work “is not yet completed” and there is still a place for ‘ecu-maniacs’ striving for the goal of evangelism of the world in our generation. At the anniversary event, the Tuesday Group presented a cheque for £200 to Dean Forde for his Black Santa Appeal and later this year will also present cheques to local charities. Thanks at the celebration were also expressed to Catherine Black of Mid and East Antrim Council for her support and assistance of the group throughout the years.